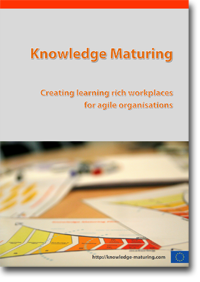 Knowledge maturing describes the development of knowledge from a team, community, or organizational perspective. Learning is an social and collaborative activity in which individual learning processes are interdependent and dynamically interlinked with each other: the output of one learning process is input to the next. If we have a look at this phenomenon from a macroscopic perspective, we can observe a knowledge flow across different interlinked individual learning processes. The knowledge becomes less contextualized, more explicitly linked, easier to communicate, in short: it matures. goal-oriented describes knowledge maturing as a process with a direction. The goal can be an individual goal (e.g., deepen understanding in an area out of curiosity), a team goal (e.g., grasp known errors with respect to a product that the team works on), or an organisational goal (e.g., refine an organisation?s core competency). Goals typically change over time and get aligned in social processes, resulting in a direction as a (mostly a posteriori) interpretation. collective level can refer to different levels of granularity, e.g., a team, an organisation or a com-munity. Knowledge maturing is not the result of an individual?s activity, but of an interconnected series of activities of interacting individuals, frequently also within different collectives. knowledge is understood as both cognitive structures bound to individuals? minds (becoming manifest in their behaviour) and as an abstraction of the knowledge of individuals in a collective.